Domestic stocks plunged in line with Asian shares which fell up to 5 per cent on Thursday. Could the 1987 stock market crash happen again? A decline of up to 20 percent in one day is possible today, but it would likely be a more orderly process. Fund flows are likely to resume once the global risk-off sentiment were to subside. “The stock market goes up, the stock market goes down,” Mulvaney said. Nine of the 29 NBER credit events had banking crises. The KSE100 index tanked 700 points to 45,190 within minutes of the court verdict. With Dhanteras approaching, traders’ predictions range from flat to as much as 10-20 per cent growth in jewellery sales . One area in which Trump has maintained relatively decent approval ratings: the economy. The Nikkei stock index is down 21% from its recent peak in June last year, and is down 57% from its all-time peak in 1989. A Sun spokesperson also added that some of the information presented is more than 10-15 years old. US gold futures were up 0.1 per cent at $1,233.70 an ounce. According to lore, a surge in inflation would lift interest rates, causing bond prices to decline and thereby wrecking bond portfolios. US gold futures were up 0.2 per cent at $1,225.60 an ounce. Donald Trump says: "The only problem our economy has is the Fed"
"The only problem our economy has is the Fed. They don't have a feel for the market," Trump said on Twitter. The Sensex hit a 52-week low last week. Find out if this is a short-term market correction or the beginning of a bear phase. China's economy is going through a rough patch, and fears things could get worse have been exacerbated by the recent crash of the country's market. According to Credit Suisse, the stock market crash is becoming an issue for the country's growth, and as a result. The police probing the stock market crash that wiped about $ 3.2 trillion of capital out of the market today claimed to have found clues. Here are top five reasons why the Chinese stock market made a smart recovery towards the close of today's trade. The crash has been a bitter pill for the real economy, and will be a huge comedown for policymakers. What is China's A-share MSCI inclusion? Its EM index has funds with assets under management in excess of $1.6 trillion benchmarked to it. Xu and several other executives of Zexi were arrested on charges including insider trading and stock market manipulation, the Post quoted official media as reporting. Should I sell my investments in Reliance Growth Fund? Applied to data between 2004 and 2012, the method shows that increases in searches for business and politics preceded falls in the stock market. The Shanghai Composite Index has fallen 27 per cent in less than a month - a huge drop compared to the 117 per cent gain over the last eight months. When the MACD crosses above the signal line, it gives a bullish signal on the charts. As investors assess their battered portfolios, there is a sense of shock and helplessness. Market regulator SEBI is also looking at aligning various routes for making foreign investments into a single route. The Shanghai Composite Index slumped 3.4 per cent to 3,370.65 points. "We never spent a single marketing dollar until 2014 when Sequoia Capital invested in us. That was the first time we started spending on marketing." There’s never a bad time to have a lot of money, except maybe for the last few weeks. Reliance, HDFC twins, SBI, YES Bank and Axis Bank were the top contributors in Sensex's decline. In 1930, 12 million people were out of work, every day 12,000 people lost their jobs, 20,000 companies went bankrupt and around 23,000 people committed suicide. We will help bring to your notice some truly interesting articles/blogs/videos in the realm of personal finance from across the globe. 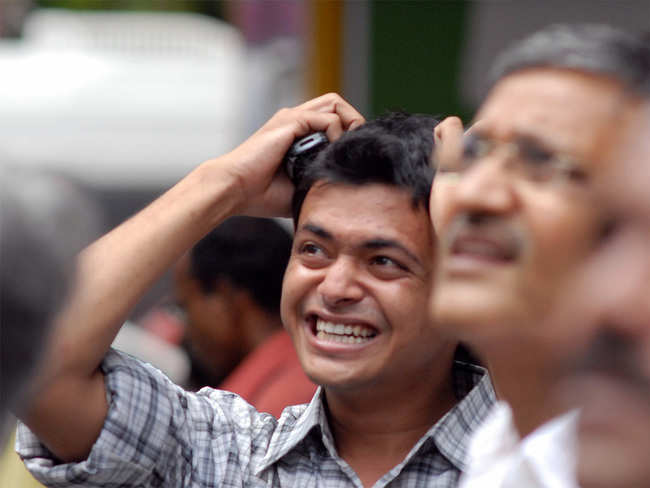 Continuing its downward spiral, the BSE Sensex today tanked by 340 points at the close of the trade. He said in an interview that he believes gold prices will rally further. Observing that India has missed the tag of fastest growing economy by 0.1 per cent, Jaitley said, that as per the IMF, India will again become the fastest growing economy. Was rupee relatively stable despite global turmoil? During the day’s trading, the rupee dipped as low as 64.40 as the local stock market tanked, mirroring global weakness. Rich people, middle income group, youngsters: Who needs financial advice the most? An online survey by ET Wealth shows that only 12% of investors in India have financial advisers. You too may be missing out on the right kind of guidance. Instead of panicking, Indian investors are taking advantage of the market dip and investing in stocks and funds. The situation is tricky as the rupee has slid by over 15% this year, but gold prices have also fluctuated. BJP leader and founder of Investor’s Forum, Kirit Somaiya, has demanded a comprehensive probe into the stock market crash, role of the regulators and the finance ministry. Mobius is set to step down in less than a week but this won’t be the last of him as an investor. After accepting job offer in 1987, Mobius headed one of the first emerging-market equity fund. Exchange rates are becoming a weapon of choice, leading to "currency wars". China, for instance, has benefited greatly from an undervalued yuan. Commodities trader Ivan Glasenberg, head of Glencore International also suffered reverses. He lost £788 million as his share price fell sharply by 13.2%. The assets under management (AUM) of this category have risen sharply in the past one year. In the real world, people who trade based on fundamentals don’t have infinite resources. These 20 stocks surged up to 211% since demonetisation lows; Do you own any? The list includes Bharatiya Global Infomedia, which has soared 211% till date. Shares of the company jumped from Rs 5.06 on Nov 21 to Rs 15.76 on Jan 17. Portfolio insurance is an investment hedging strategy that can help you avoid losses—or cut them—if the market falls. Offshore-traded Chinese companies already comprise a large chunk of MSCI Emerging Markets Index. The reason was the stock market crash known as "Black Monday" on October 19, 1987. Nilesh Shah, Managing Director of Kotak Mutual Fund, said Indian households had more money in cash than in equity market (excluding promoters). Why India is inflation prone? It has got a lot to do with infrastructure. Deutsche Bank Analyst Jim Reid, who puts out a daily note on the markets for clients, is having a tough time coming to terms with the lack of movement. The 12-month removal rule would be limited to Chinese companies. The report pointed out that around 82,000 HNI’s, defined as those who have assets over $1 million, left their home countries last year, versus 64,000 in 2015. In an interview with Real Vision TV, Felder expresses his concern that the lack of volatility will inevitably create more volatility, the likes of which have never been seen before. Apple's $ 280 billion dollar m-cap loss recently is the world’s third largest for private companies. ET takes a look at blue chips. Unfortunately, in the market crash the country has been experiencing since June 12, consumers are getting absolutely crushed. The VIX averaged 23 per cent and realised volatility averaged 21 per cent. ET takes a look at blue chips in India and around the world that have been badly bruised by the markets. That’s what happening in China now, according to Chanos. Banks are financing uneconomic projects and/or losses with debt carried on China’s bank balance sheets. Constant learning made him one of the greatest cricketer of our times. In finance, learning can also translate into earning. Post-Glass-Steagall, the floodgates were opened for big ticket mergers like the one between J.P. Morgan and Chase Manhattan in 2000. Some 24 mn small investors in China or nearly one-third of the investors in the country's stock market fled the turbulent market after the recent crash that wiped about $3.2 trillion of capital, a government agency said. Earnings may take a while to recover but analysts believe further corrections may spell buying opportunity, reports ET. Without slaying the corruption and sleaze inherent in Indian business today, we cannot hope for a clean financial system that aids all round growth. Investors should take the opportunity and start purchasing shares for long-term portfolio while traders can initiate long positions with proper stop losses. Domestic mutual funds went on a buying spree during the period to take advantage of the lower valuations, experts said. The Aam Aadmi Party today said if the Union Finance Minister was unable to contain the currency downslide, he should relinquish the post. China stocks: Here's one thing keeping them from getting completely crushed? As all of China watches in horror at the country's stock market plunges day after day there's only one idea keeping people invested. With rupee coming under severe pressure, RBI is seen intervening in the forex market by releasing dollars from reserves to sweeten the fall, forex dealers said. Data compiled by WGC shows that in 2015 China was the world's largest consumer of gold, accounting for 29% of the global demand. A falling stock market improves dividend yield, which is calculated as annual dividend divided by the current stock price. China has set its growth target for 2016 in the range of 6.5-7 per cent, while that for years leading to 2020 is above 6.5 per cent. Chinese Premier Li Keqiang said that the world's second-largest economy has the confidence to handle the complex economic situation at home and abroad. Buoyed by strong inflows in equities, the asset base of country's mutual fund industry surged 7 per cent to an all-time high of Rs 13.16 lakh crore. In 1999, Bachchan's ABCL approached BIFR to be rated as a sick company. Trump's Entertainment Resorts had filed for bankruptcy 4 times. The devaluation of the Chinese yuan currency may have a transient impact on India, Finance Minister Arun Jaitley said on Monday. The biggest determinant for market direction next week will be the RBI's rate-setting meet. The devaluation of Chinese currency yuan will have an adverse impact on India's textiles exports and clothing, which is facing sluggish growth. SBI chief Arundhati Bhattacharya today said Chinese currency Yuan devaluation is a challenge and expressed hope that India has potential to overcome this challenge. "The devaluation will affect India's exports not only to China but to other countries also with increasing competitiveness of Chinese exports. Shares of state-run oil marketing companies HPCL, BPCL and IOCL rose 2-3 per cent in trade on Monday. Steve Wozniak, the engineer-inventor, doesn’t expect artificial intelligence to become smart enough to replace the human brain or cause job losses. Survey questions asked respondents what they thought of everything from job security to the stock market and how recent trends have impacted their attitudes. Mulye says the stock market crash following the devaluation of the yuan by China has made companies that are perceived to withstand volatility more attractive to investors.